I want to change the world…with research, teaching, and public health interventions that address the linked challenges of achieving environmental sustainability and improving human health. Katie received her BA from Princeton University in 2006 and her MPH and PhD at the University of California, Berkeley. Katie is a lecturer in the MPH program. 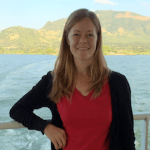 Katie takes a Planetary Health approach to examine the links between environmental change and human health in her research and teaching. Katie’s work has focused on global fisheries and the households that are reliant on the environment to access food and income. To understand health-environment dynamics, she uses interdisciplinary approaches from ecology, public health, economics and sociology.